Reviews | Buckeye Fire Extinguisher Adhesive Label - Red and White, 12" x 4"
Buckeye Fire Extinguisher Adhesive Label - Red and White, 12" x 4"
Clearly identify the location of your fire extinguisher with this 12" x 4" adhesive fire extinguisher label. It features a vibrant red background and lettering with a white arrow for great contrast that allows your customers to see and read this sign from across a room. For those who may have trouble reading, the arrow helps guide gazes to the extinguisher's location. Quality Vinyl adhesive sticker. easy to peel back. I have these on drywall and no peeling off. I have a few on wood and a few on FRP PVC walls and same results. NO peeling, no runny paint/ink. No issues. would recommend these with no issues. Really great price for this adhesive fire extinguisher label. it is the perfect size to place over your fire extinguishers. Sticks very well to the wall. I recommend placing on a smooth surface. Even with my rough surface it’s holding on really well. We use a lot of smoke for cooking and it hasn’t filled itself w smoke at all. No cleaning. Yay! I was concerned since the price was so low, that it might not be big enough for customers and staff to take notice of a very important sign but its regulation size if not bigger so I'm glad we got a great deal on it! Not a whole lot to say about this. It is a great and necessary product that was super easy to hand with the attached adhesive! Fire extinguisher sign adheres to the wall without a problem, it's bright and easy to read - large enough print to view from across the room. i bought this buckeye fire extinguisher adhesive label for my business because it is a requirement. it looks pretty resistance, good quality and perfect size. These stickers are very easy to see from far away. The coating is strong and they have not faded even in our kitchen. Easy to peel. Not too much to say, but this fire extinguisher label has worked out as advertised. It sticks very well to the wall and even hold up to cleaning up around it without peeling off or anything. Love this product so much! I put this sticker on upper wall where the fire extinguisher is to have it easy on our sight and anyone in the kitchen! This fire extinguisher sign is perfect size . I am using at my business it's has good quality paper and stickiness. Easy to peal at back of sign and stick and good size big letters. I was so excited to see this sign for sale on WebstaurantStore.com. For such a low price it is an amazing deal! It was very easy to install... it probably tool less than a minute to install, but offers a great level of additional safety as it draws attention to the fire extinguisher if/when it is needed! Excellent product. These stickers are very high contrast and easy to see from far away. The coating is strong and they have not faded even in our kitchen. The Buckeye 12" by 4" Fire Extinguisher Adhesive Label is good for bringing necessary attention to the location of fire extinguishers. It is already backed with adhesive for immediate installation and use. Convenient way to make sure that you know where your important fire extinguisher is. It's hard in the heat of the moment unless you have clear signs! Good price, the design is easy to let people know where the fire extinguisher is. The shipping is a little bit slow, but if you are not in need of this label in urgent, it's fine to wait and get the good price. A sticker, sticks well to my oddly textured walls to note where my unused (thankfully) fire extinguisher is. Bright and easy to see from a distance. It is very important that you indicate where your fire extinguishers are located in your building. This red and white adhesive label clearly indicates there is a fire extinguisher below the label. During an emergency knowing where the fire extinguishers are can be the difference between disaster and non-disaster. This label is great at being able to help people identify where the fire extinguishers are. I'd recommend having these up in your place of business. for great contrast that allows your customers to see and read this sign from across a room. For those who may have trouble reading, the arrow helps guide gazes to the extinguisher's location. I have been pleased with this twelve inch by four inch red and white Buckeye fire extinguisher adhesive label. I was happy to see the background red for easier viewing from a distance. It is very easy to clean and does not take up much space when stored. I would recommend and would definitely order again in the future. Excellent product , easy to install made with a quality vinyl material with good adhesive. I was able to install these on stucco walls, tile walls and cinder block walls without issue. This product is very inexpensive and one more check off of your compliance list for the state safety guidelines. This sticks very nicely to the wall. This fire extinguisher label is good, but I think I prefer the 18" one more. Got if for my boyfriend's restaurant and they ended up going with the 18" one. Does the job! This label is large with red lettering! A must for having extinguishers. Cheap too! I gave it 5 stars. Get it, from here! Webstaurant! Safety is top priority and labeling exactly where the fire extinguisher is located is essential in all safety standards. This sign clearly points that out. After years of inspections and nothing being said I was told i needed marker signs about all extinguishers. I have signs but they are not the required height. So rather than paying 5 dollars each I ordered some from the Webstruant store. it is a good price for this fire extinguisher label, very easy to show for my employee. and clear sign. i used in my store. One of the required signs that should be. Ordered this one two weeks ago. Very noticeable (white and red). Great choice taking into consideration the price. This is a red sign with a large white arrow pointing down and red letters. It has a shinny finish and a very adhesive back. A very easy way to make the fire department happy. It applies on the surface very easy, even if it's no entirely flat, since this is basically a sticker. This sticker makes my staff and customers aware of the location of the fire extinguisher. The adhesive allows it to be stuck on a variety of surfaces. The red and white sign is very noticeable from the colors, the sign virtually sticks to anything, and the presentation is neat and sleek. The sign looks good anywhere. 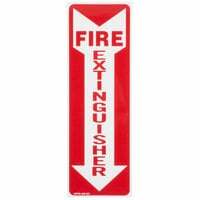 signage is a must for fire extinguishers and you will find none cheaper than this. just peel and stick on wall and its good to go. I have had this label on my wall for quite a while and it still stuck strong to the wall. some peel off but this one is great. What an affordable way to clearly identify where your fire extinguishers are! Easy way to meet health code regulations! Nice and attractive label! Easy to install!! I beleive that it is code for the fire extinguishers to be clearly labeled on the wall. So you're gonna have to have some of sign for it. This is the cheapest one ive found so far. Very easy to read, nice size, adhere well, and affordable! What more can you ask for? Will be using these in all of our trailers and trucks safety first without breaking the bank! Fire safety is a serious issue, but many people fail to address it properly. Most of the people who own a fire extinguisher fail to mark it right. With this fire extinguisher label you can address the fire safety the right way, so the fire extinguisher can be easily found at the time of need without the loss of valuable time. 10-pack of adhesive labels is enough to mark the most kitchens out there.